Radiant Manufacturers CEO Bheeshma Chand said the grape juice concentrate will be used to make red sparkling wine. Aizawl, May 15 : Just two months since the lifting of prohibition in Mizoram, an eastern town has entered the industry-produced liquor map by supplying 16,000 liters of grape juice concentrate as an initial consignment that will be used to make a well-known regional wine brand of the North-East. The consignment, produced by the Champhai Grape Grower’s Society and loaded into two trucks, was flagged off by Mizoram’s Horticulture Minister P C Lalthanliana from Champhai town on Thursday. The grape juice concentrate is headed towards the Guwahati distillery of Radiant Manufacturers, which has for close to a decade been making and selling the Vihno Porto port wine brand through the North-East region and Bhutan. The company entered into an agreement with the CGGS, which is made up of 279 families that own vineyards, back in January. According to the agreement, the society will supply 3.6 lakh liters to the alcohol manufacturer per year. Radiant Manufacturers CEO Bheeshma Chand, 29, said the grape juice concentrate will be used to make red sparkling wine and, in the future, perhaps brandy. 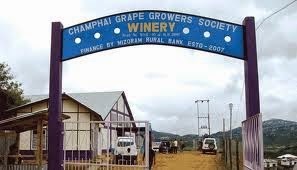 Chand said his company has been using grape juice concentrate sourced from Goa, Maharashtra and Karnataka for their wine brand, but said the quality of grapes grown in Mizoram is of a better quality. The proximity between his facilities and the raw material (road travel by truck between Champhai and Guwahati is roughly three days). Champhai and the nearby village of Hnahlan, about 54 kms away, host the first and only vineyards in the whole of India’s North-East region. Both places set up wineries in the late-2000s and have been manufacturing two brands of port-wine under the brand names Zawlaidi and Zowine, which were and continue to be sold locally. They were for more than half a decade the only legal drinks available in Mizoram because of prohibition. But CGGS assistant-secretary C Zohmingliana admitted that with the lifting of prohibition in July last year and the formal opening of outlets this March, the brands have suffered a hit since perceived better IMFL brands from elsewhere began entering the state legally. He pegs the reduction in demand for their wine brands since then as more than half of what it used to be before.